Our Paperboard sleeves and Envelopes are available in 8pt. or 12pt. material. Perfect for storage or distribution, our Paperboard products are rigid and protect from CD/DVD breakage. The windows in our Paperboard products are made from polypropylene – a high quality clear plastic that is durable, non-abrasive and won’t wrinkle. 100% made in the U.S.A. 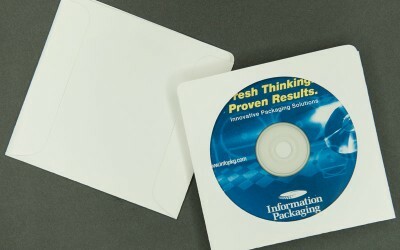 Custom printing is available for all of our Paperboard CD/DVD sleeves and Envelopes. Please call Information Packaging for more printing information.